A counter on the Piramal Sarvajal home page reads: ‘549,554,053 litres served and counting…’ That’s a tally of over half a billion litres of pure drinking water served to the most disenfranchised areas of India. Water is a basic need for human existence, but some 150 million underserved Indians lack reliable access to safe drinking water at affordable prices. 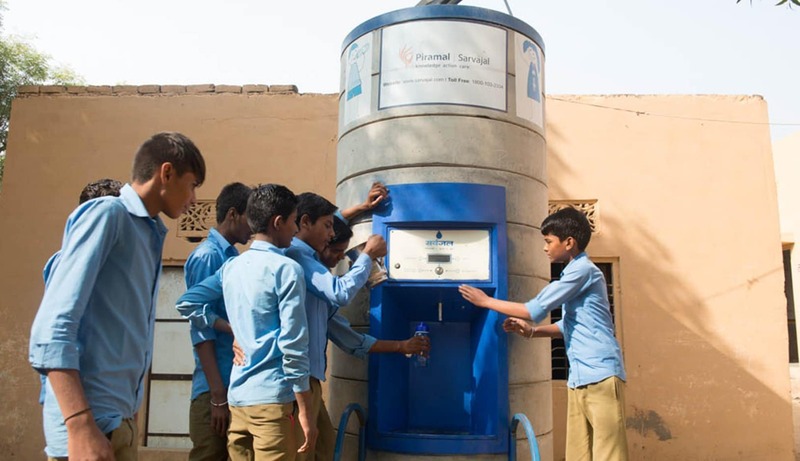 In 2008, the Piramal Foundation – the philanthropic arm of the Ajay Piramal-led Piramal Group – started Sarvajal (meaning “water for all” in Sanskrit) as a pilot project in Bagar, Rajasthan. The aim was to provide affordable safe drinking water through the introduction of technology and pure drinking water solutions. Solar-powered, cloud-connected Water ATMs are exactly what they sound like. Found in densely packed residential areas in busy streets, stores, schools and hospitals, the kiosks dispense water instead of cash. Customers purchase a ‘water balance’ on prepaid rechargeable cards. Easily topped up using a mobile phone, swiped cards give 24/7 access to water that is cheaper than any other outlet. The dispensed water has been purified at localised plants to remove germs and to make sure that minerals, such as harmful fluoride, are kept within recommended levels. Vending machines allow people to fill their containers and give credit balances and information about water quality. 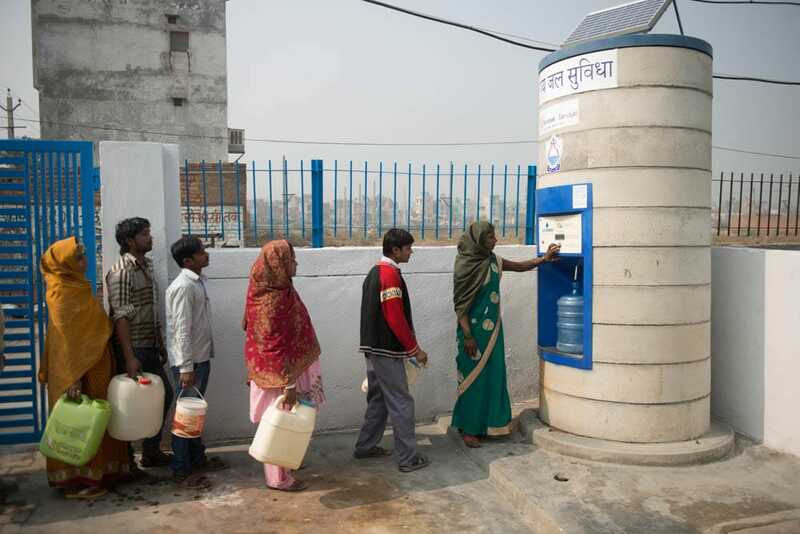 Water ATMs are an attractive business opportunity for franchisees who act as community water stewards, pre-paying Savarjal for the technology to filter water locally and sell it on – and the franchising model works for Savarjal as it allows them to penetrate local markets. Village level entrepreneurs are trained to operate water treatment systems and provided with water purification technology, maintenance and marketing tools. A cloud-based programmable logic controller device called the ‘Soochak’ is installed on each of their treatment plants to monitor quality, litres produced, machine health and the amount of wastewater created. Much to Sarvajal’s surprise, uptake was rapid, because although people weren’t used to paying for clean water, they understood its link to health. Currently over 180 Water ATMs serve 300,000 people daily across 12 Indian states. And the new technology is alluring ‘tech-savvy’ men, who see collecting water from the water ATMs as a way to show their ability to earn – and learn. Water-fetching and carrying duties have traditionally fallen to women and girls, so the gained time can be used for other income-generating opportunities. The idea of dispensing water from automated machines is now being copied around the world. “Market-based models have a great replicability potential and that makes the journey from innovation to enabling many more people very exciting and fulfilling,” adds Padmanabhan. Tags: Business, Clean water, Community, Employment, Environment, Food, Health, Hygiene, Income, Mentoring, Pollution, Population, Poverty, Sanitation, Water.